February half term can be a stressful time. It’s not been that long since the Christmas holidays and you may be out of ideas for literary ways to keep your little ones (and of course yourself) entertained and educated. 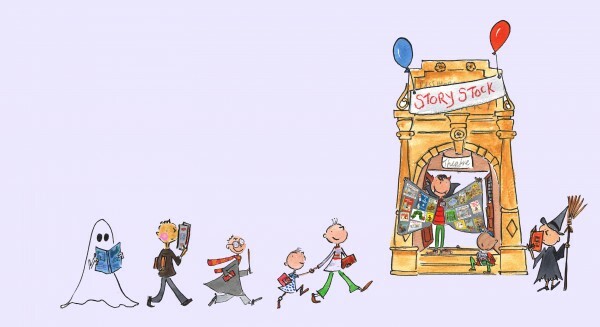 Relax, we’ve got the perfect trips and activities for story-lovers young and old. You’re never too young for an immersive experience. Who can resist stepping inside a gigantic chocolate cake? In true treasure hunt tradition, younger children can go on their very own Bear Hunt trail, whilst older children go on a fact-finding quest and create their own poems along the way. They also get a glimpse into Michael Rosen’s past and learn what it was like to go to school in the 1950s. This children’s literary festival runs from the 17th-19th February and is packed full of events suitable for children aged 2-11. Older children can develop their skills in creative writing workshops or follow in Adele’s footsteps and learn how to be lyricists, whilst younger children can make puppets, enjoy fairy tales, and if that wasn’t enough, each day culminates with a Mad Hatter’s Tea Party that everyone can take part in. Does someone in your family love to read about turbo-charged superheroes thwarting baddies? Perhaps they might like to have a go at drawing, animating or even modelling their own creation, or maybe they are ready to produce their very own publication – an 8-page mini comic. Well, The Cartoon Museum is running a series of workshops where kids can learn from the experts. Check out their programme below. Sadly, these are only for children, but if I was taking my kids, I’d definitely try to blag my way in – looks great! This is a universal game to encourage storytelling that can be adapted and expanded in many ways. I came across this great idea on The Imagination Tree. Basically, you encourage your children to fill a basket or bag with small storytelling props, and then they use them to tell you a story. This reminds me of some of the improv shows I’ve seen at the Edinburgh Festival where someone in the audience will shout out a place, a name and an action, and the actors have to make up a story including those things. You can make this a family game by selecting props for each other in turn and then telling each other stories. You can also adapt this so that each player selects one prop, tells a bit of the story and then passes the props onto the next player, who selects their own prop and carries on the story. I dare say adults could easily adapt this for a dinner party game! When the stories need jazzing up swap in some new props for the old ones. Discuss the scenario so the child can really imagine it. Now get them to write a short story based on that bus/train journey. They should start with the one-sided dialogue of the person speaking on the mobile phone. Then write a paragraph of the speaker looking out of the bus/train window and reflecting on what has just happened. Remind them that they should write the conversation in a realistic way – that people don’t tend to speak in full sentences all the time and can get interrupted. Give them a pile of magazines/newspapers and ask them to cut out interesting people/places from the articles and objects from the adverts. Ask them for a few places where they would like the stories to be set – they can either draw maps of these places themselves or you can print out a Google map for them. If you have any family photos you are happy to include in the game, add those in too. Ask them to write a single word on a piece of card (and repeat). Ask them to write a number on a piece of card (and repeat). So, what you should end up with is a box full of visuals, maps, single words and single numbers mounted on card. Now the fun begins. Ask one child to pick 5 things out of the box and place them on a table so that everyone can see them. Now everyone has a few minutes to think about how they can create a story including all these things (in any order). Then, when everyone is ready, go around the table and tell each other your stories. You can then discuss which bits of which stories worked the best and why. No doubt some of them will have you laughing out loud. You can extend this to a written activity too – give out pens and paper and set a timer to go off in 10 minutes then ask each child to read out what they have written. This can also be adapted in much the same way as the storytelling basket – with storytellers taking out one card, telling a bit of the story and then passing the box on to the next player.